Leela Subramaniam: I'm from Los Angeles, California, and attended UCLA for my undergraduate studies where I double majored in Art History and Music. I did my Masters and Professional Studies certificate at the Manhattan School of Music. that I realized that opera was what I wanted to pursue as a career. LS: The first opera I saw was The Marriage of Figaro. I remember thinking that opera as an art form was crazy and wonderful, and I was in awe of Mozart. LS: I realized how important it is to trust your instincts and savor the joy of singing. LS: Sing what you love and be relentless in honing your technique and artistic style. Look at obstacles as blessings which will strengthen and enrich your craft. OI: What roles have you performed? Any dream roles you would like to sing or opera houses you would like to perform at? LS: While at Manhattan School of Music I sang the titles roles in Massenet's Thaïs and Donizetti's Lucia di Lammermoor, as well as Angelica in Haydn's Orlando Paladino this year. Earlier this year I also had my Carnegie Hall debut performing Niece 1 in Peter Grimes with the St. Louis Symphony, and performed in the world premiere of Kamala Sankaram's Thumbprint with the Prototype Festival/Beth Morrison Projects. 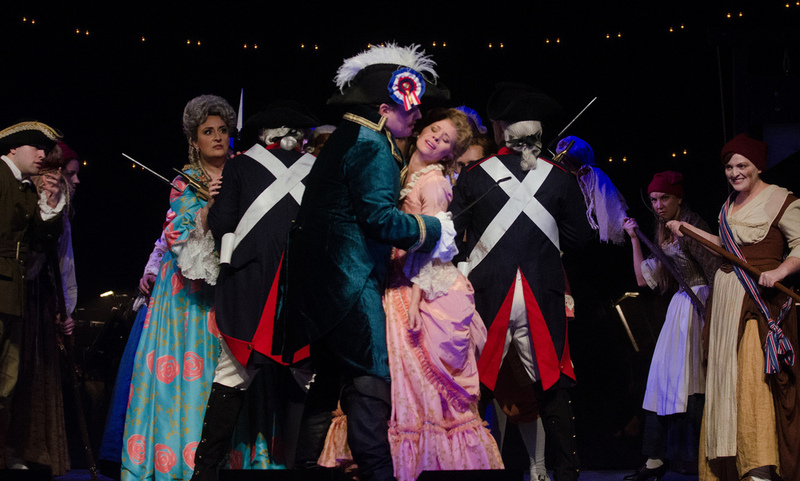 This past summer I was Giannetta in a fabulous production of The Elixir of Love at the Opera Theatre of St. Louis. My dream roles are Violetta in La Traviata, the Donizetti queens, Pamina in Die Zauberflöte, Konstanze in Die Entführung aus dem Serail, Cleopatra in Giulio Cesare, Leïla in Les Pêcheurs de Perles, any of the Massenet heroines, and Donna Anna from Don Giovanni. Of course the Metropolitan Opera has been a dream opera house for me to perform in, as are all the major houses of the world, including the Weiner Staatsoper, La Scala, and Opéra National de Paris. LS: It gives me the chance to perform and get valuable feedback. I also love meeting and hearing new singers. LS: I'm passionate about Bel Canto, Mozart, Handel, and Britten. And while it's hard to narrow it down, Eugene Onegin, La Traviata, Le Nozze di Figaro, and Pelléas et Mélisande have always been operas that I love. LS: Classical music, Fado, and Flamenco. Lately I've been listening to Marin Marais' Pièces de Viole de Cinq Livres played by Jordi Savall. Kidon Choi: I am from Seoul, South Korea and did my undergrad in music at Hanyang Univ. in Korea, in voice performance. I am now a Master student at Manhattan School of Music. KC: When I started to study voice for being an opera singer. KC: Rigoletto is the first opera that I saw. That opera influenced me to become an opera singer. OI: What roles have you performed? Any opera houses you would like to perform at? KC: I performed Rodomonte from Orlando Paladino, Peter from Hänsel und Gretel, Rigoletto from Rigoletto, Amonasro from Aida, and Germont from La Traviata. I would like to perform Rigoletto at the Metropolitan Opera House.